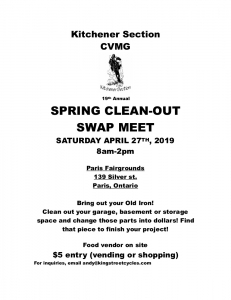 Event Description Saturday, April 27 at the Paris Fairgrounds,139 Silver st., Paris ON, Canada. Bring out your old Iron! Clean out your garage, basement or storage space and change that junk into gold! Find that perfect piece to finish your project! $5 entrance, vending or shopping!